Lesson Focus: Jesus loves children (Matthew 19:13-14). Read story from a child-friendly Bible. Song-time: "Jesus Loves the Little Children"
What You Need: Unpainted wooden hearts, sponges, acrylic paint, trays, black permanent marker, magnet, glue. What You Do: Write child's name on back. Pour paint into trays. Children dip sponges into paint and dab the heart with color. Be careful not to muddy the colors. 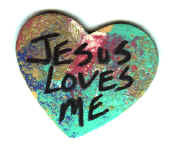 When the paint is dry write, "Jesus Loves Me" on the front of the heart. Glue magnet to the back.